This night owl stays perched beside your bed and keeps your glasses in reach when it's time to turn in. As if the owl needed any more help looking like a smarty pants, this wise winged figure wears your glasses when you don't have to. 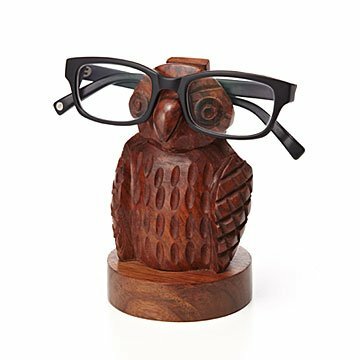 Using a single piece of sheesham wood, Fair Trade artisans in India hand carve the richly finished owl, making him a charming piece of decor on his own or when rocking your signature specs. A small hook in the back keeps your glasses right where you left them, eliminating the daily blurry-eyed search for your favorite frames. Handmade in India. 5.5" H x 3" dia. Due to the handmade nature of these items, there may be some slight variation. I love things that are attractive and functional at the same time. This item fits the bill perfectly. My husband bought this for me for my birthday and I LOVE it! It's a solid piece (I've had it since January and mine hasn't fallen apart - still in very good shape as it was when I received it) and it holds my thick glasses perfectly well. My husband and I joke each night that my owl gets a lot smarter with my glasses perched on its beak. My review won't be verified because he bought the item through his account or as a guest - I'm not sure which as the gift was a surprise - and I'm reviewing the item from mine. I recently had to buy eyeglasses, to which I discovered that nice eyeglasses are expensive! (who knew?) I bought the owl eyeglasses holder to keep it on my desk at work so whenever I need to take my glasses off, I they are safely stored and easily accessible- I don't run the risk of damaging them or having someone place paperwork or files on them. And it's an added bonus that the owl looks adorable with the glasses on! I bought this gift for my sister at Christmas and it was her favorite gift of the season! It's unique and thoughtful, with wonderful design details. A perfect gift for anyone who wears glasses. The product is a good small/medium size- good for all sized nightstands. It's good to note it's a little flat on the back but the quality of the carved wood is fantastic. Looks great on my wife's night stand! It's a bed side eyeglass holder. The only small critique I have is the website doesn't show the whole item. The back side is flat. I thought it would be carved like an owl, but it flattens. It doesn't bother me, because it's up against the wall, but it might disturb someone who wants it in the middle of the room where people will see the back side. For all my friends who wear glasses! It's well made, my glasses rest securely on it and it's an owl!!! I wanted to give a practical and unique gift, this product was perfect. One owl in the kitchen and one in office. Looks great and no more searching for reading glasses!